What have we been up to this week…. We stayed at Atherstone bottom lock for 3 days as the weather forecast was for wind; and it certainly was windy, but as we were going down the canal, it turned out to be a sheltered spot. On our way again and a stop at the sani station at Bradley Green we headed for Polesworth. We were going to stop but decided to carry on as we had a rendezvous with a couple we met on the Llangollen and have kept in touch with. 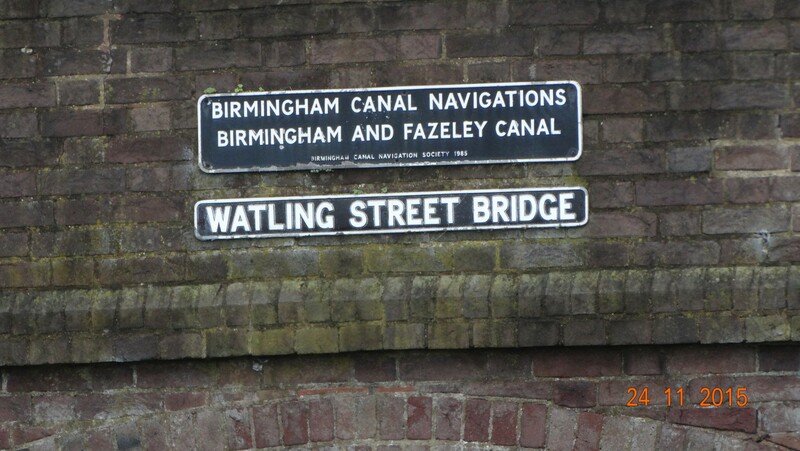 They had been into Birmingham and were headed for the Coventry canal. We had an overnight at Amington, which was a little too built up for our liking although good moorings. Off again on Saturday (woke up to a smattering of snow), to meet with Keith and Margaret on NBPolleur at Fazeley junction. 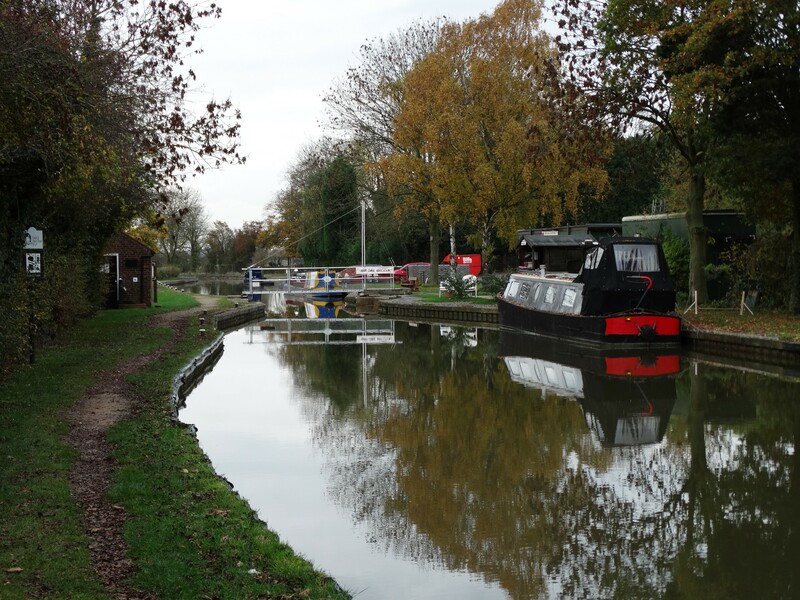 We had 2 locks to do at Glascote; Charlie was glad to be through them as although they are scheduled to be closed in February for repair, we didn’t want any mishaps that would prevent us from getting to the boatyard. We had a good weekend. Fish and chip supper on Saturday evening whilst catching up with each others travels; and I invited them for home cooked Sunday lunch onboard Breakaway. 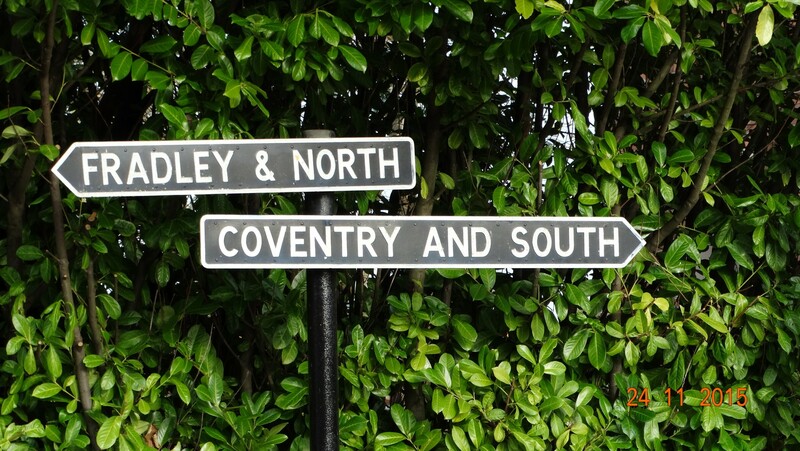 We had a lift with them on Monday back up the Coventry and walked to Tamworth (another ancient capitol of Mercia), after saying goodbye for this year. We will probably meet up again next year somewhere. It was nice to have a bit of company with different conversation. 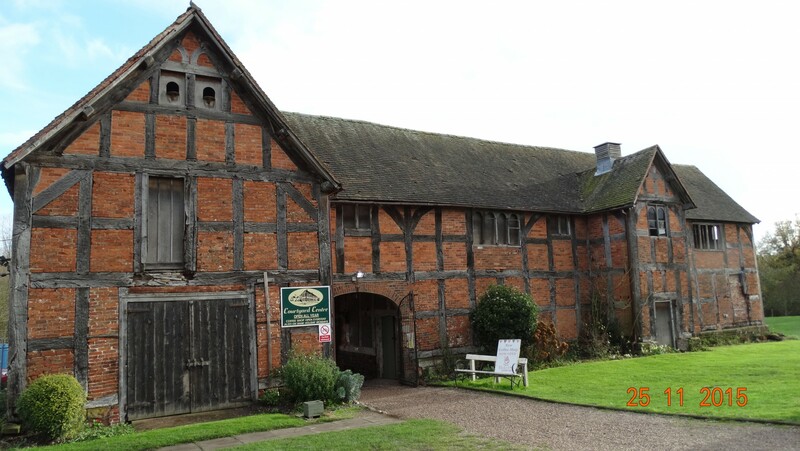 I would have liked to visit Tamworth castle but sadly it is closed for the winter. 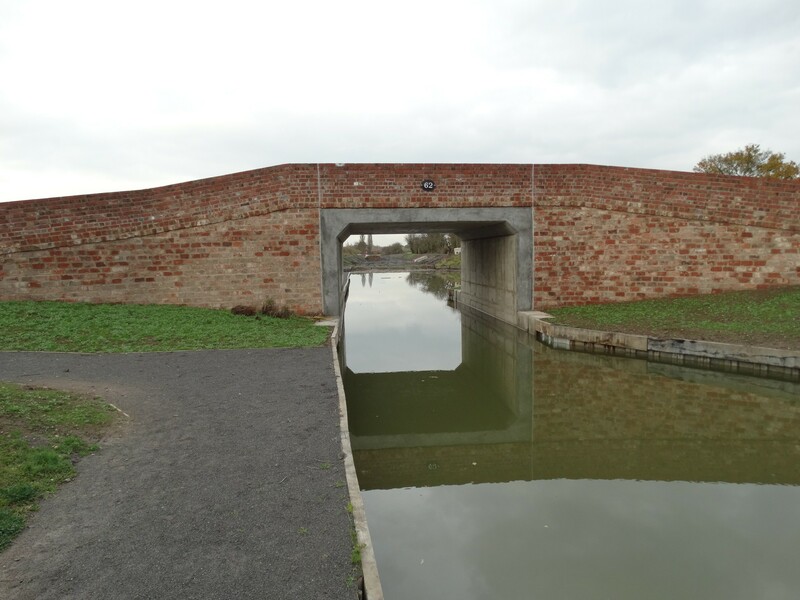 Yesterday we decided to partake of the sani station facilities at Fazeley, and turn round and head up the Birmingham and Fazeley section to the first lock. 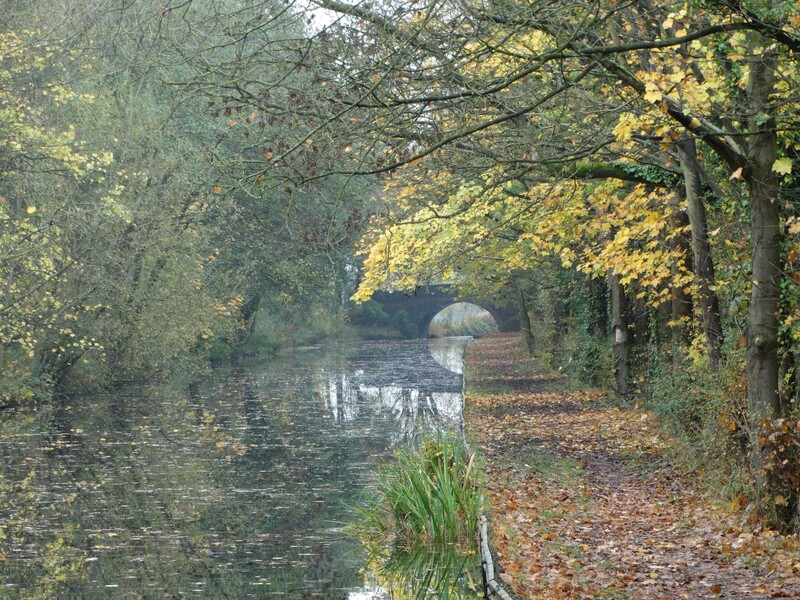 Now we have been on this section before in 2011 on our first narrowboat holiday. We remember it well as we sampled all the seasons that England produces in one day!! 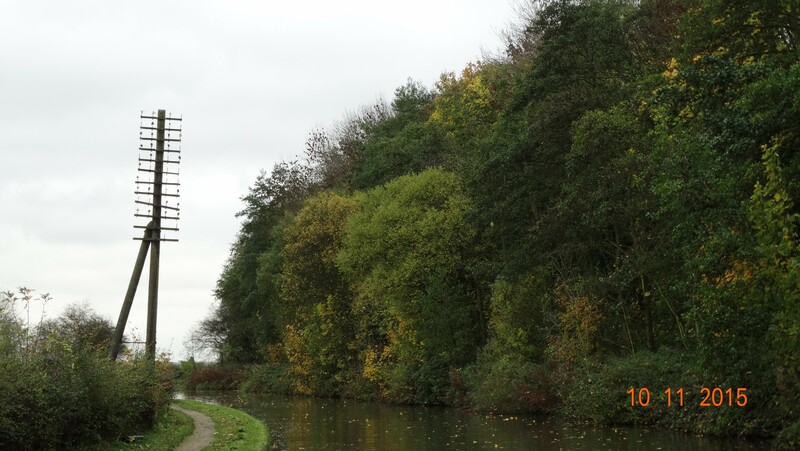 We travelled as far as the winding hole below Curdworth bottom lock, then turned. It was a lovely bright day for cruising and not as cold as the previous few days. 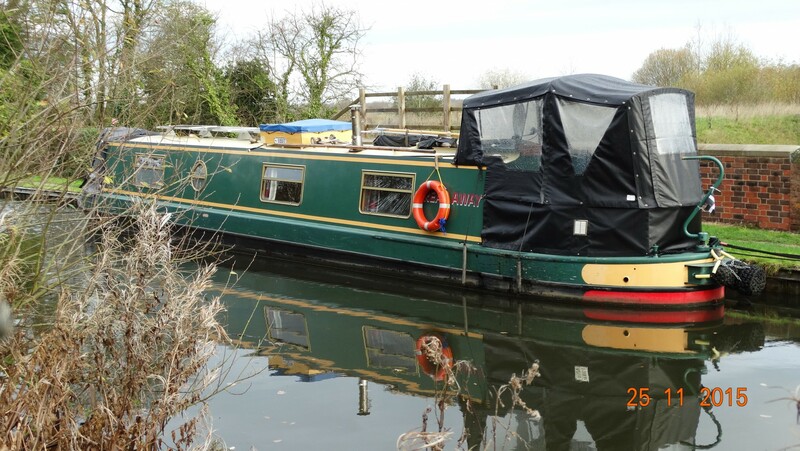 We have now moored beside Middleton nature reserve, which is run by the RSPB and it’s volunteers. Today we walked through the woodland walk area to Middleton Hall. There has been people occupying this land for over 1000 years, but it is the Domesday book that first mentions it. 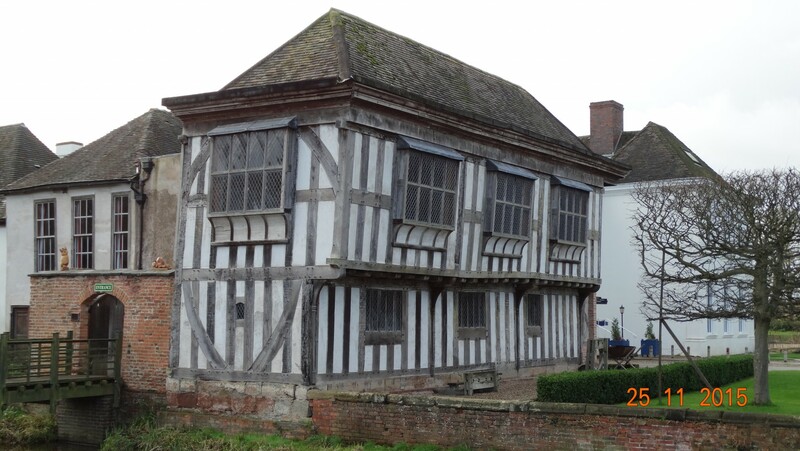 There have been many owners over the years (Queen Elizabeth 1 visited in 1567), until it fell into disrepair and was rescued by volunteers who formed a trust to save and repair it. 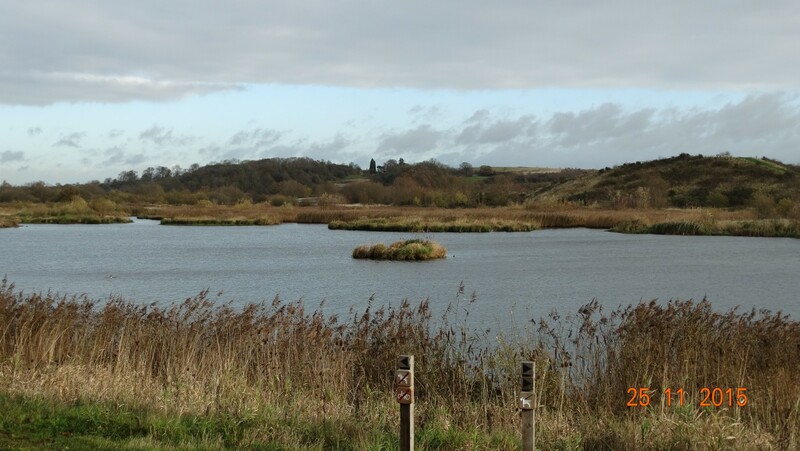 The land around it once housed gravel pits, and now it is the nature reserve. A picture of our mooring from the bridge. 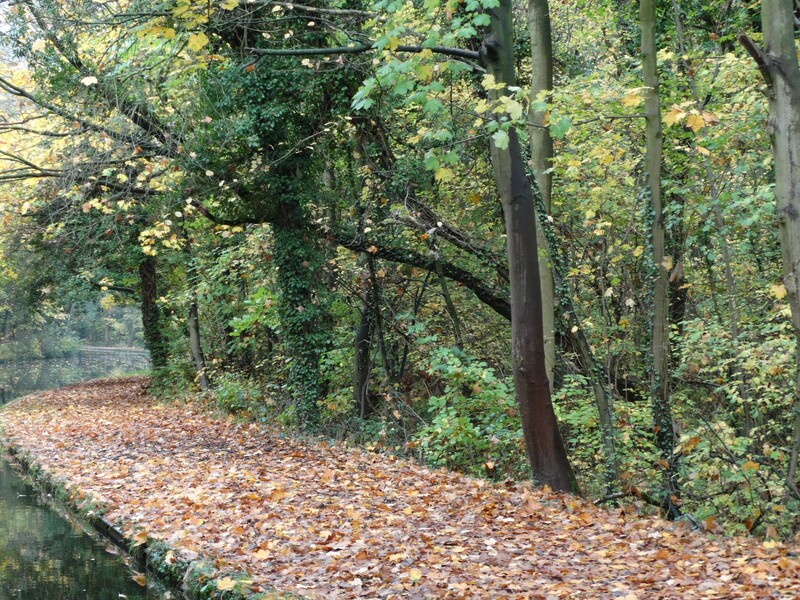 It shows how quiet the canal is now. Since we have been here only one boat passed this morning going down. A lovely rural spot, but only downside is whatever sunshine happens this time of year, is very low in the sky and doesn’t boost the panels enough to charge the batteries, so an occasional run of the engine is needed. I would like to stay here till the weekend, as Middleton Hall has a christmas fair; but I’ll have to see what the skipper wants to do; he doesn’t do shopping very well! It was looking christmassy there. If we stay I may go on my own!! Breakaway from the opposite side of the bank. Note the colour as in the new year it will be looking different. We have 3 weeks now to wait around so not long, then it will be a mad rush to get christmas presents (no room to store anything on the boat). Could do internet shopping but recently had 2 parcels go astray, so a bit unsure of ordering anything again, especially this time of the year. I keep saying it but I really don’t know where the time is going. It’s been 12 days since my last blog, and it only seems like yesterday. I’ll have to remember now what we have been up to. 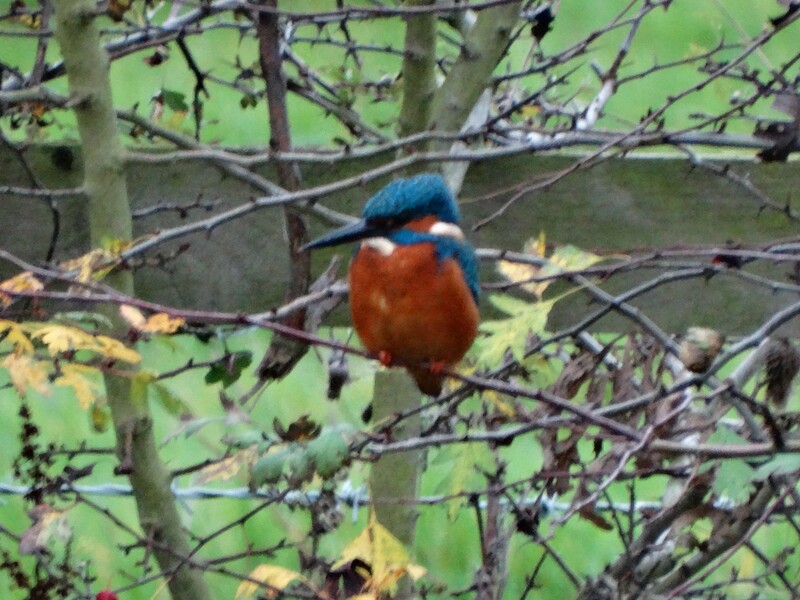 While we were moored for a few days we spotted a kingfisher. 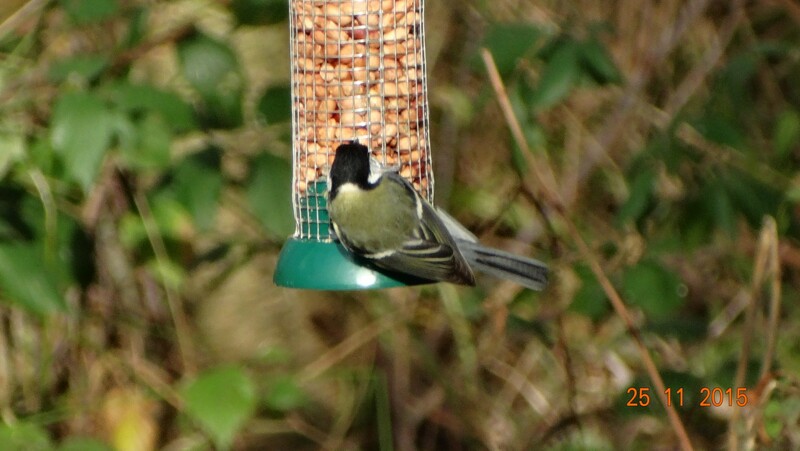 Now these are notoriously difficult to photograph, as no sooner do you get one in focus it usually flies away. This time one was posing for us on the opposite bank, and Charlie was lucky enough to get a few snaps of it. 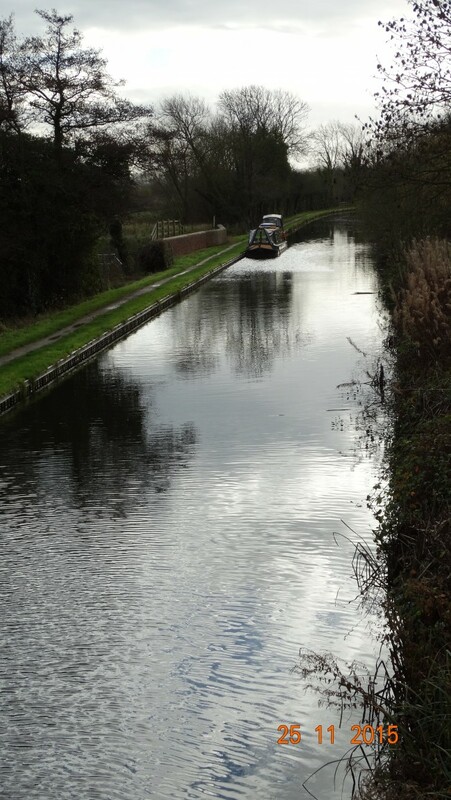 After our few days at the end of the Ashby canal we set off again; washing machine on, so water topped up and cassettes emptied; a top up of water was needed at Sutton Cheyney to ensure a full tank, and we had 2 stops before we finally reached the end. Back onto the Coventry canal so we could make it to Atherstone for the weekend my daughter was coming again. 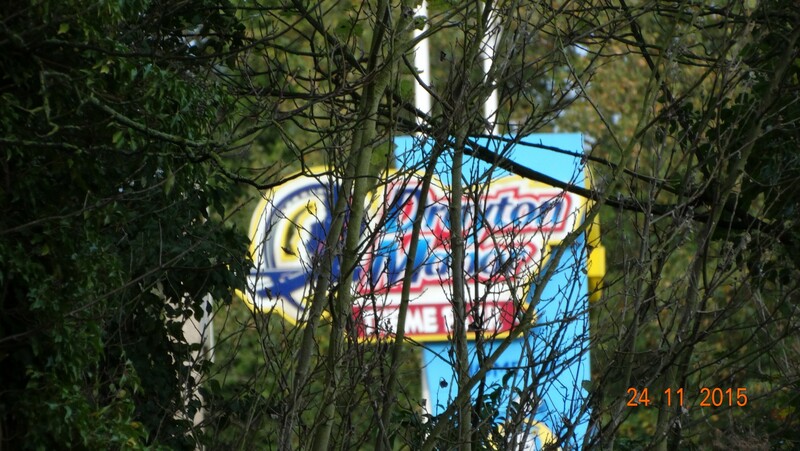 Cruising past Nuneaton. We had an overnight at Springwood, and just before our mooring there is an old fashioned telegraph pole. old fashioned telegraph pole with it’s cross arms and insulators still intact. 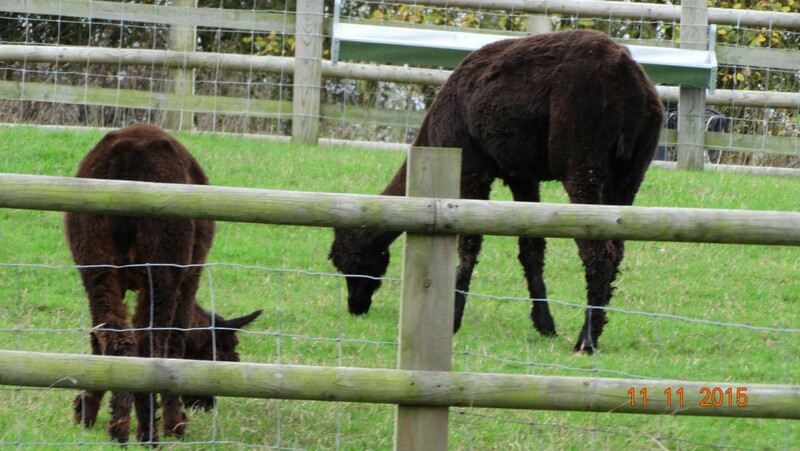 Along the route I managed to snap some Alpaca’s in a paddock..
Also cruised past an old wharf at Hartshill, with buildings and crane still there. Finally reaching our destination at the Atherstone top lock. When we passed here in August we couldn’t moor as it was full of boats. Now it is much quieter, and we had a choice of positions. After mooring I set off for Fish and chips (a chippy nearby). And we knew that fuel boat Auriga was making it’s way up the Atherstone flight, and we didn’t want to miss him as we needed diesel and coal. We flagged him down and did the necessary (needed a mortgage to pay for it!! ).We needed shopping but decided we would get through the first 5 locks, and stop near The King’s Head pub, where my daughter could park the car for the weekend. This was also much handier for the shops, so Thursday we set off and did the 5 locks. Volunteer lock keepers were there tidying the gardens along the route and lent a hand so it made locking a bit easier. Friday we set off with 2 trolleys and a backpack for Aldi, and Co-op, that were approx 10 minutes away. Groceries loaded for the weekend and beyond (hopefully I won’t need much more in the next 5 weeks before the boat goes into the yard for repainting). Daughter and family arrived Friday evening. Weather wasn’t brilliant but we managed to go through Lock 6 in the flight, turn around, and end up back where we started on their arrival. Gave her a taste of what happens when working locks. The rain arrived, but we had a meal booked in the King’s Head pub, so we didn’t mind. A lovely meal was had by all, in very pleasant surroundings. Sunday we walked with the kiddies to the playpark, all dressed in our wet weather gear and wellies! This was to try and use up some of their energy, but as always I don’t know who gets more tired, them or us. We had Sunday lunch on board. I had pre cooked a joint, roasted veggies and an apple and blackberry crumble (using the last of my foraged blackberries), so it made it easier to finish off. They left us mid afternoon, and we did a little tidying before having a restful Sunday evening. It’s always a little cosy with 4 adults, 3 dogs, and 2 kiddies on our 50′ boat. Monday we had to go back through the 5 locks again to go to the sani station. All the cassettes were full, and we needed water. , and I wanted to put the washing machine on again. We had a little wait at the top lock as there was already a boat there.,but we had 2 volunteer lock keepers to chat to. It transpired that one of them had a daughter that lived in Padstow. Small world. Sani business done, and around we turn again to get back through the 5 locks going down (think they thought we were mad). 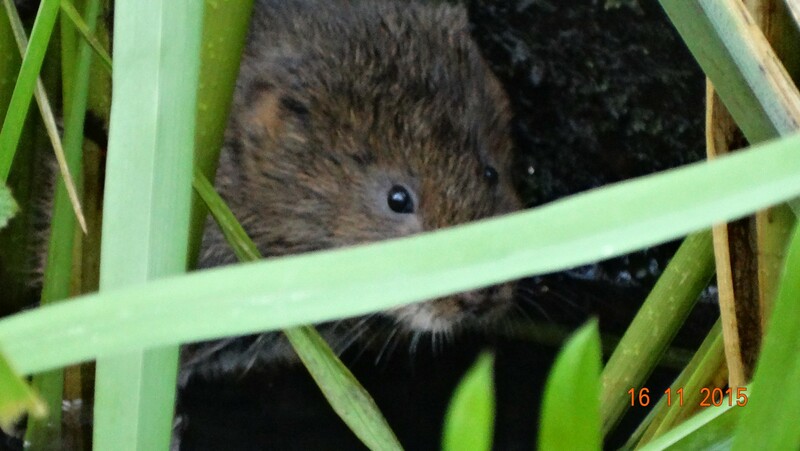 On the way though we spotted a vole and managed to get a picture of it. Back at where we started again! We had another walk into Atherstone, and I checked out the charity shops for DVD’s, and managed to get 10. Good to have new DVD’s in case we can’t get a satellite signal. Today the weather has forecast strong gales for the afternoon. 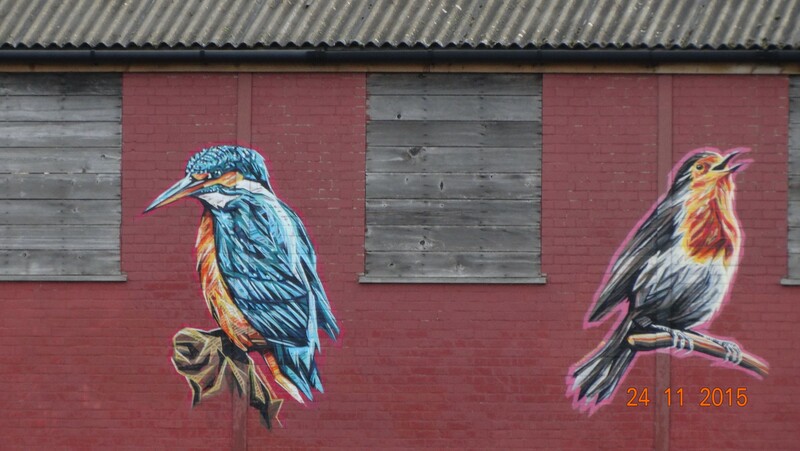 We have now done the other 6 locks in this 11 lock flight, and found a quiet spot. Nothing much moving today, probably due to the weather forecast, but as I am writing this blog the wind is picking up and the boat is rocking. Just hope we stay pinned to the bank!! Not blogging so much now as going slower to kill time., and retracing some steps we have already done. 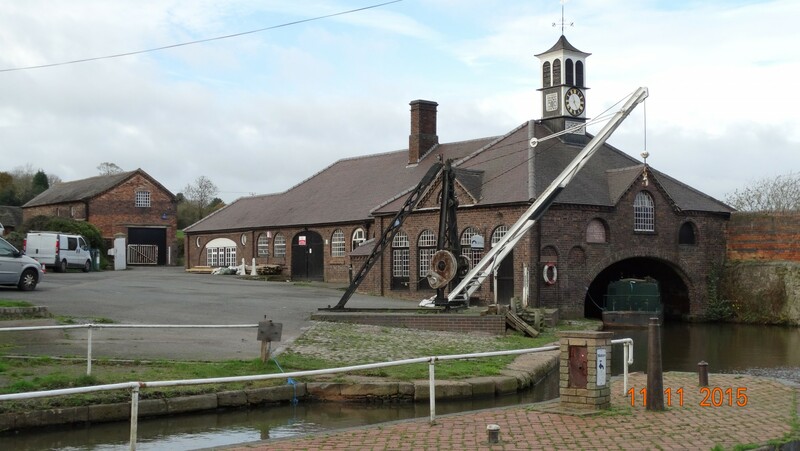 Last Thursday while we were still at Hawkesbury junction, we changed the leisure batteries. We knew it would be a fiddly job as Charlie has to get into the engine housing to do it! Old batteries were disconnected, and we had to lift them out one by one, bearing in mind the spec on these things say they weigh 54kgs each! Once done and a coffee later the new ones were lifted back into place and connected back up again. This job took all morning. Now what do we do with the old ones? We were told we could money back at a recycling centre, but the one local to Coventry said they didn’t take marine batteries. We don’t have room to store them, and we don’t have a car ourselves. The chap on the boat in front of us said he would help, but Daventry was the nearest place (half an hour away by car), and he didn’t sound keen to take us there. He knew a local boater who was an avid recycler so we gave the batteries to him. I’m sure they would share the spoils. Friday morning we set off to turn around and go back to Tesco to top up on shopping before the weekend as we would be having some visitors. Friday evening my daughter brought the grandchildren for the weekend. We thought we may manage 2 nights with both of them. Charlie kept his hearing aids out though! Saturday we were off again deciding to go back onto the Ashby canal. We made it to Sutton Cheney Wharf where the Bosworth battlefield is, and some woods to walk round. The weather for the weekend was lovely which made life a bit better with grandkids on board. As it was Halloween they had bought pumpkins to carve out, which we did on the journey, along with colouring and dot to dot! Once it was dark the pumpkins looked good with small torches in. Popcorn and 2 Halloween kiddy films in the evening to make up for not trick or treating! Sunday my daughter and son-in-law came around midday. We had a walk through the woods, and I managed to cook a roast dinner for 6 in my little oven. They set off after dinner and once again peace reigns and we are on our own again. They are coming again in 2 weeks so we need to keep our strength up. From Sutton Cheney we went to Bosworth Wharf where the marina is (we stayed in Sept). On the way we encountered a hire boat that was going a little too fast around the bend, coming toward us on our side. Evasive action was taken, and no harm done, but we don’t think the skipper had a clue as to which way to turn the tiller! We then decided yesterday to cruise to the end of the navigation. The weather yesterday turned out nice and we had a lovely cruise. No boats going in the opposite direction this time. 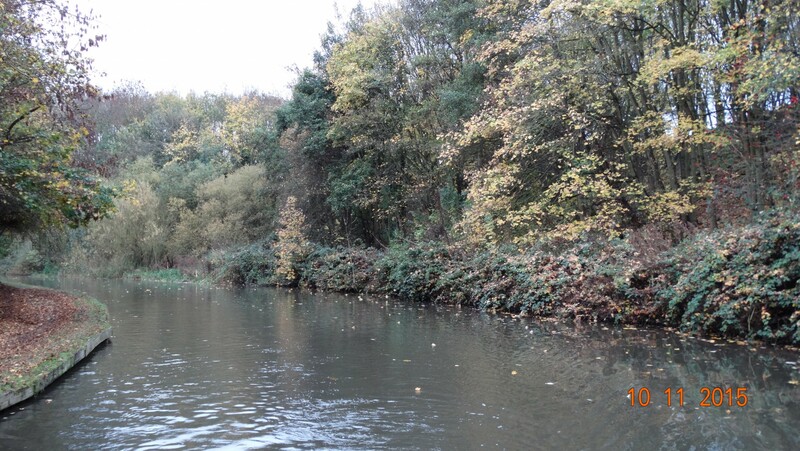 At Shackerstone we suddenly saw a tree land in the canal. 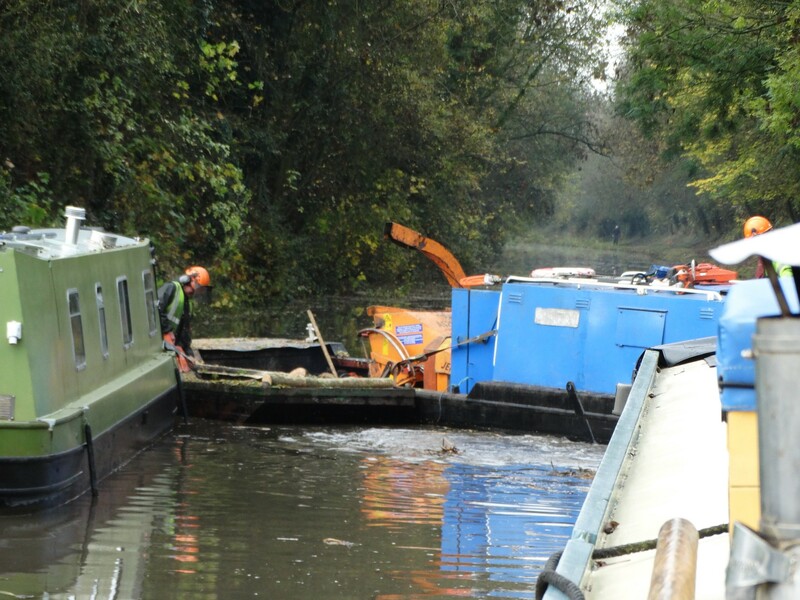 We stopped just past the winding hole to investigate, to find a work boat and crew felling and chopping tree’s. We decided to wait till they had finished what they were doing as we were in no hurry, and after approx 45mins we were off again. 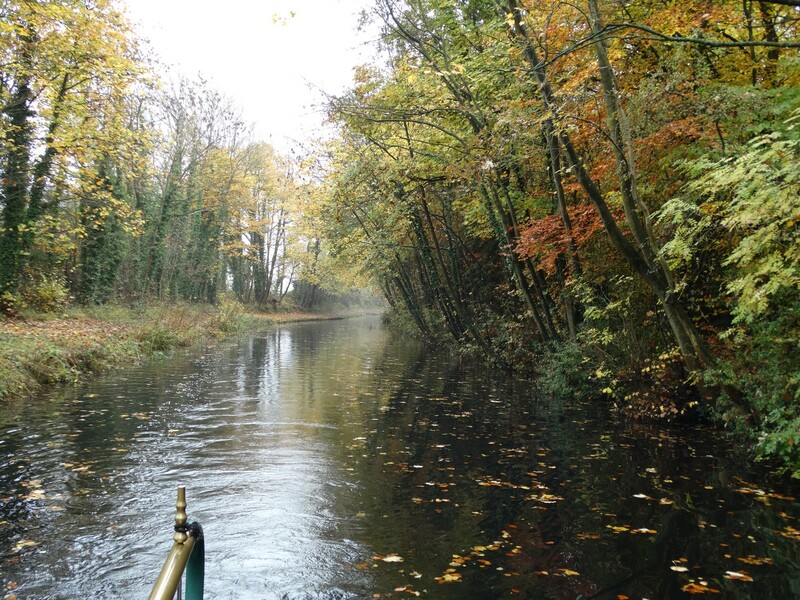 The cruise to the end goes through Gopsall woods and the trees were looking stunning. We are now at the end of the navigation again. We were last here on the 1st September, so it looks very different. 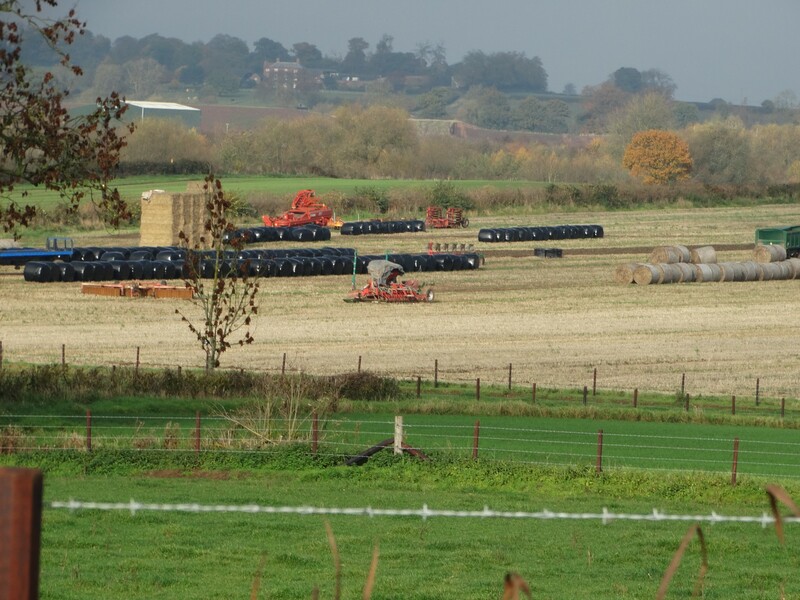 A field locally still has the round bales in a line (they were doing it when we were here last time), but now some are wrapped. We will stay here for a couple of days as there is a sanitary station here, and the weather doesn’t look too good for the next few days. 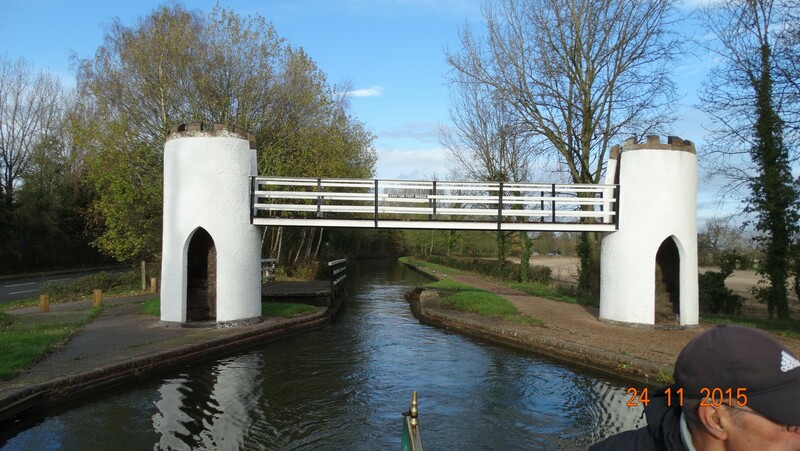 The bridge that closes the canal, and is the end of CRT waters. 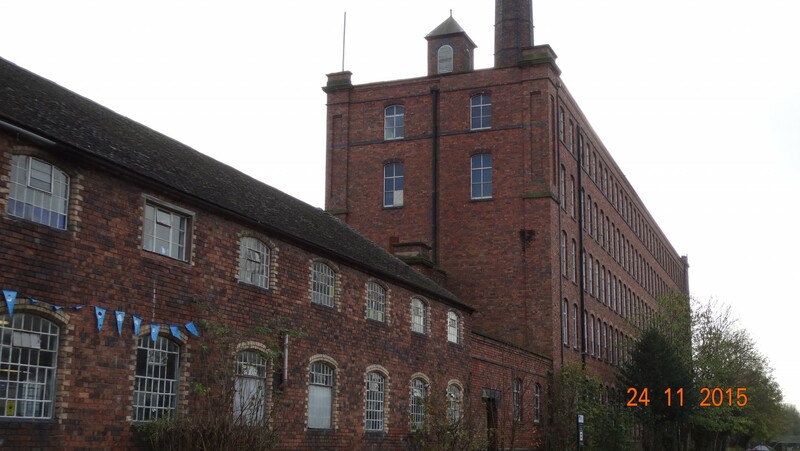 What lies beyond is being restored and belongs to Leics council and the Ashby Canal Association are looking after it. And finally the next bridge that was being built when we were last here as we couldn’t get past. There is a 50′ winding hole just beyond, but then the canal is filled in from here. 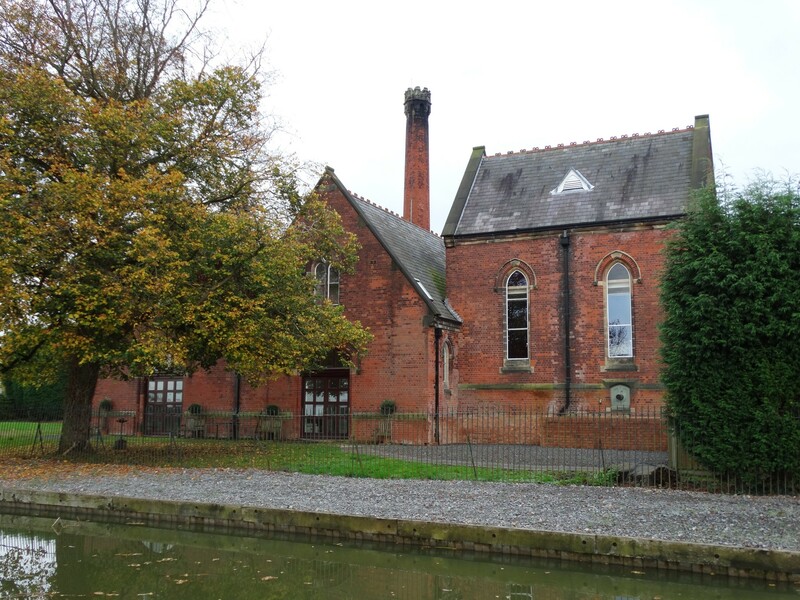 Once we get going again we are heading for Atherstone where there are locks (or locker’s as my grandkids say). My daughter wants to experience the working of them and as there are 11 of them, I think that will give her something to do!